Introduction: Automated Teller Machine (ATM) is the well-known machines to provide electronic access to customers. With advent of ATMs, banks are able to serve customers outside the banking hall. ATM is designed to perform the most important functions of a bank. It is operated by plastic card with its special features. The plastic card is replacing cheque, personal attendance of the customer, banking hour’s restrictions and paper based verification. ATMs have made hard cash just seconds away all throughout the day at every corner of the globe. A decade ago ATM was a mere cash dispenser but today ATMs allow doing a number of banking functions – such as withdrawing cash from one’s account, account deposits, making balance inquiries and transferring money from one account to another – using an ATM card and personal identification number issued by the financial institution. The most recent additions include bill payment and mobile banking. The history of ATM can be traced back to the 1960s; when the first ATM was invented by John Shepherd-Barron who was the Managing Director of De La Rue Instruments. That machine was used by Barclays Bank (Barclays Bank in Enfield Town in North London, United Kingdom) on 27 June 1967. However, the first bank to introduce the ATM concept in India was the Hong Kong and Shanghai Banking Corporation (HSBC) in the year 1987 followed by Bank of India in 1988. In Bangladesh, SOCBs (state-owned commercial banks) set the trend and set up the first ATM here in 1992 followed by ANZ Grindlays Bank, which has been accoutered later by Standard Chartered Bank Bangladesh, in 1994. Worldwide the number of installed ATM units was over 2.75 million in 2013 and stood at 3.22 million by 2016 (Figure-1). It is also forecasted that by 2020, number of ATMs will reach at 4 million (ATM Industry Association). 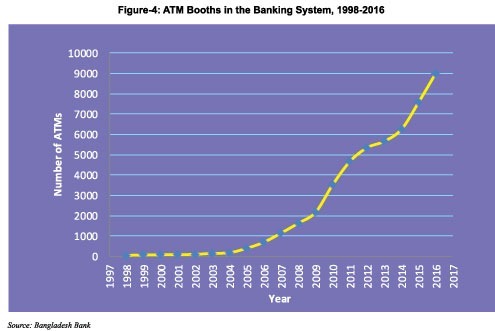 According to World Bank, the Asian nation of South Korea stood at the higher end with 278.73 ATMs for 100,000 adults in the year 2015. Macao SAR, China, was the second country with the most number of ATMs per 100,000 adults. Here, the number stood at 254.13 while in Canada, which occupied the fourth spot, the number was 220.52. Meanwhile, some of the nations that had above 100 ATMs per 100,000 adults were Portugal, Russia, Australia, UK, Japan, Germany, Peru, Bulgaria, Brazil and France to name a few. India, which is currently in the news due to the government’s demonetization policy and emphasis on shifting towards a cashless economy, ranked poor in this regard. The emerging economy reported just 19.71 ATMs per 100,000 adults. Meanwhile, its neighbor China had in 2015, 76.37 ATMs per 100,000 adults. In the World Bank list, while Australia may have ranked at the higher end with 164.62 ATMs per 100,000 adults, New Zealand ranked way behind with a figure of 69.48. The European Union boasted of 70.36 ATMs per 100,000 adults, with Portugal ranking the highest with a figure of 174.85. Finland stood at the bottom with just 33.25 ATMs per 100,000 adults. Meanwhile, South Sudan and Afghanistan stood at the other extreme with just 0.91 and 0.96 ATMs per 100,000 adults. The South Asian nations of Bangladesh, Pakistan and Nepal too ranked low with figures of 6.79, 8.79 and 8.96 respectively. important for banks to reduce the cost per transaction for increasing spread that, in turn, will increase the profitability of banks. Use of technology in banks reduces cost. Banks have realized that cost of transaction drastically declines from brick and mortar structure of the branch to online delivery channels like ATM, POS Terminal, Mobile Phone, Internet, etc. ATM Banking in Bangladesh: The Bangladesh ATM industry has seen explosive growth in recent times. ATMs represent the single largest investment in the electronic channel services for the Banks. As at the end of December 2016, the number of ATMs deployed in Bangladesh was 9019. Most of the ATMs are installed in the divisional cities and district-level town. Around 44% ATMs are installed in Dhaka City. A very few ATMs are being operated in rural areas, less than 4.84%. It is mentionable that 46% of ATMs is set up by Dutch-Bangla Bank Limited (DBBL) alone. 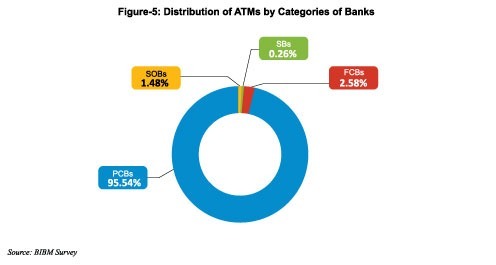 Among 9019 ATMs, 95.54% are setup by Private Commercial Banks, 1.48% by State-Owned Commercial Banks, 0.26% by Specialized Banks and rest of the 2.58% by Foreign Commercial Banks (Figure-5). Volume of Transaction: The total volume of transactions through ATM is recorded at Tk. 0.70 billion in 1999, growing moderately up to 2001 and recording a transaction of Tk. 2.11 billion at the end of December 2001. 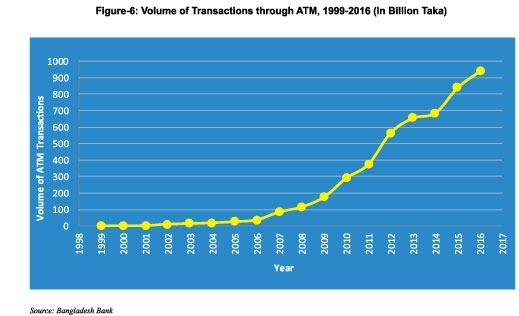 Since 2001, a significant increase in transactions through ATM is observed showing a transaction volume of Tk. 37.19 billion by the end of 2006. After that it increases exponentially due to the huge setup of ATMs by DBBL. 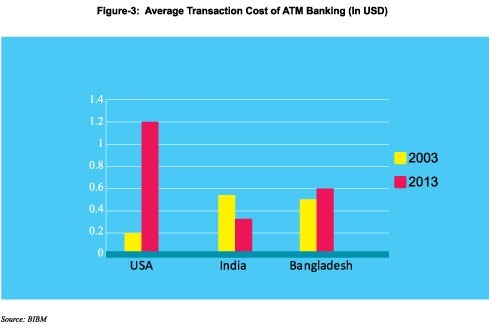 According to Bangladesh Bank, the total volume of transaction through ATMs across Bangladesh was around Tk. 939.1 billion in 2016. Both Debit and Credit Card is being used in Bangladesh for ATM transactions. Debit Card, was introduced by one Nationalized Commercial Bank (NCB) in 1999 and by the end of the year, the number of customers stood at 2,014. Similarly, Credit Card came into Bangladesh’s market in 1997 through one PCB and one FCB; and the total number of customers stood at 1,607 by the end of 1998. Up to November, 2016, total number of plastic cards were recorded at 1,08,02827 (Debit card: 97,05,601, Credit Card: 9,25,025 and Prepaid Card: 1,72,201). Among the electronic cards only 42% are chip based EMV secured card. But 58% are less secured magnetic strip card that is vulnerable for skimming-fraud. Moreover, 94% cards are local and 6% international for border less transactions. 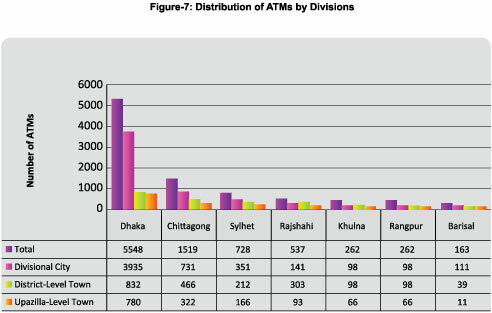 Distribution of ATMs: Among the seven divisions highest number of ATMs are installed in Dhaka Division (61.5%) followed by Chittagong (16.8%), Sylhet (8.1%), Rajshahi (5.9%), Khulna (2.9%), Rangpur (2.9%) and Barisal (1.9%). It is seen that divisional cities have highest number of ATMs installed (60%). District-level town (excluding divisional cities) have the second highest density of ATMs (23%). 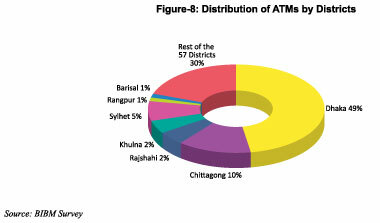 Only 17% of ATMs is installed in Upazila level-Town (excluding sadar upazila). If we consider number of installed ATMs by district, we see that 49% ATMs are installed in Dhaka district followed by Chittagong (10%) and Sylhet (5%). Only 6% ATMs are installed in Rajshahi, Khulan, Barisal and Rangpur district. Rest of the 30% ATMs are providing services to remaining 57 districts (figure-8). Purpose of Using ATM: Now-a- days ATMs are not only used for cash withdrawal but also a number of other services can be availed from them. Figure-9 shows that maximum numbers of people (100%) are using ATMs mainly for cash withdrawal. About 78% of customers use ATM for balance enquiry. A very small percentage of customers use ATM for cash deposit (17%), transfer funds (15%), ordering cheque book (3%), bill payment (9%) and recharging pre-paid cards (18%). This shows that culture of using ATMs for other banking services is yet to grow in Bangladesh. Reasons to Prefer ATM as a Delivery Channel: Figure-10 clearly reveals that 24% customers uses ATM due to its time saving nature i.e. in order to avoid travelling and avoid long queue in banks, 18% like it for its faster transaction, 13% respondents prefer it as it is easy for them to use. Whereas, 60% people are in favor of the view that it is easy for them because they don’t have to search for bank every time as they can get cash or check their balance enquiry through mini statement (account statement) by using it frequently wherever there is an ATM counter. Above all, 38% customers like it as it is having all the mentioned criteria to meet the customers’ satisfaction and saves cost. Transaction Cost Vs. No. 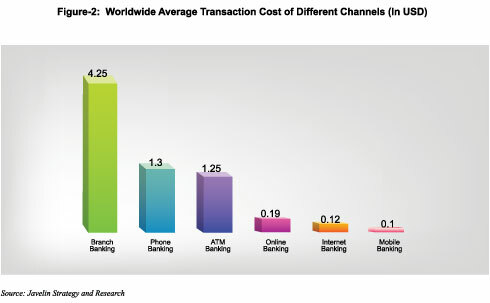 of Transactions in ATM Banking: In 2012, average transaction cost was recorded at Tk. 71 and average number of transaction per day per ATM was 27. Also in 2013, average number of transaction per day per ATM increased to 40 and average transaction cost dramatically decreased to Tk. 49. But in 2016, average transaction cost dramatically decreased to Tk. 38 as average number of transaction per day per ATM increased to 49. 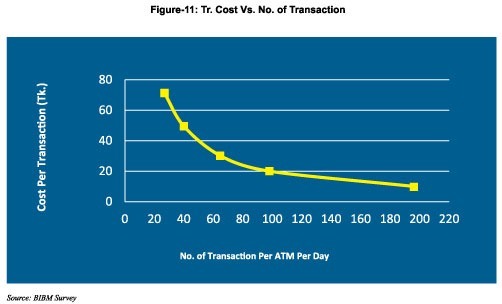 Considering all costs remain fixed, it is also seen that if the average number of transaction per day per ATM can be increased, transaction cost can be decreased rapidly (figure-11). It is to be mentioned that as the number of transactions increases, cost of loading money may be increased slightly. It is estimated that on an average an ATM is used for maximum 14 hours per day. Hence 168 transactions can be done by an ATM, if we consider average transaction duration as 5 minutes (12 Tr. per hour × 14 hours). In this scenario transaction cost could be reduced to near about Tk. 10. Moreover, with the existing ATM setup, banks may increase the number of customers also to reduce the transaction cost by increasing the total number of transactions. Customers’ Satisfaction: With a view to analyzing the customers’ satisfaction, a total of 500 respondents were selected from all over the country covering 7 Divisions, 18 Districts and 60 Upazilas/Thanas. Customers’ satisfaction is measured as a percentage of highest satisfaction. 100% satisfaction means highest satisfaction and 0% indicates no satisfaction at all. Gaps were assessed purely on the basis of the percentage of satisfaction values for each question/parameter comparing with a reference score ‘100’ which was considered to be the maximum and that any organization should like to achieve for excelling. A service gap of close to 30 and more than 30 was considered to be highly critical area for the improvement of the performance dimensions. A service gap of between less than 30 and more than 20 was considered as critical and further needs for improvements and service gap below 20 is treated as less significant. 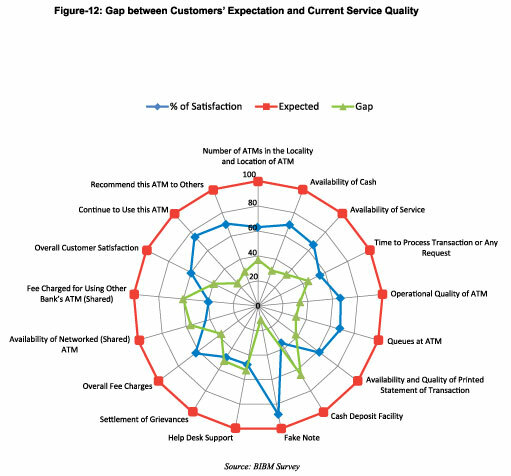 Figure-33 shows the gap between the percentage of satisfaction and highest expectation (100) of customers’ regarding ATM banking services. This will help the management to reduce the gap between the demand of customers and existing available facilities. Major Problems in ATM Banking: As number of ATMs and number of transactions is increasing rapidly, a lot of problems are also increasing with the same pace. 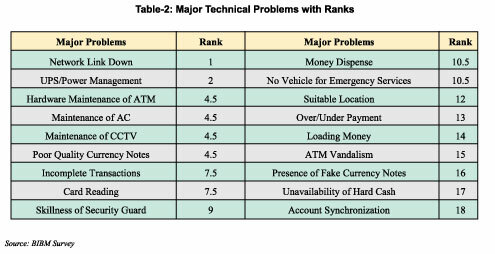 Banks are asked to provide a list of problems they have been facing with ranking. The findings are shown in the table-2 and figure-13. 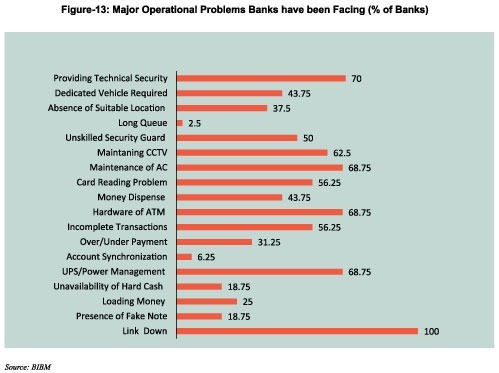 It is seen that network link down problem is the top most problem for all banks followed by power management and maintenance of the overall ATM booth. Security guard, quality currency notes and cash management comes next. Accuracy of transaction and dispute management is also a great concern. Moreover, selection of a suitable secured place is a vital issue. Frauds in ATM Banking: ATM fraud is not confined to particular regions of the world. To further complicate matters, perpetrators and victims are often on different continents, and the problems of one region can quickly become the problems of another. Card skimming was the most prevalent crime affecting ATMs in Europe. But skimming is almost controlled due to Europe’s use of anti-fraud devices, in addition to the implementation of Europay, MasterCard and Visa (EMV) technology in 98 per cent of Europe’s ATMs. ATMs that are EMV compliant have the ability to read embedded chip cards, which provide a two-factor authentication that mitigates the fraudulent redemption of stolen credentials. While the number of skimming attacks is decreasing in Europe, the number of cash trapping crimes are on the rise. In this attack method, fraudsters attempt to gain access to cash by attaching a fraudulent device to the cash-dispensing slot, causing notes to be stuck inside the ATM. The perpetrator then returns later to remove the cash from inside the dispenser. As more and more countries in Europe are migrating towards embedded chip cards and Financial Institutes in Asia are rapidly expanding their network size, Asia is fast becoming a target for ATM fraud. The most prevalent type of fraud in Asia is card skimming. Malaysia and Taiwan have already migrated the entire network to skimming-resistant chip cards. Whereas, more countries such as Indonesia and Thailand are accelerating their migration plan. North America is currently the largest ATM market in the world. Canada leads the world in per consumer transaction volumes, while the U.S. has the largest installed base. But, the widespread use of ATMs—with over 14 billion cash withdrawals in the U.S. alone—makes North America an attractive target for fraudsters around the globe. 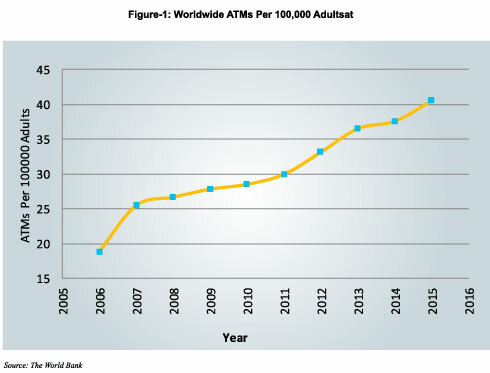 In the U.S., ATM card-related fraud has continued to rise. ATM card fraud in the U.S. is expected to increase dramatically in the coming years. A major factor is the transition to EMV compliant embedded chip cards throughout Europe, Asia, Latin America and Canada—but not the U.S. Chip-based cards that are much more difficult to counterfeit than magnetic stripe cards, which are relatively cheap and easy to duplicate. As organized criminal groups become discouraged by other countries’ anti-fraud measures, they are likely to view the U.S. as an increasingly attractive. EMV (also known as Chip and PIN) is a standard for the interoperation of smart cards and enabled POS terminals and ATM’s, for authenticating credit and debit card payments. Approximately 65% of Canadian ATMs, 75% of Russian ATMs, and 99% of ATMs in Europe and Ukraine, are EMV compliant. As long as ‘mag stripes’ are present on EMV cards, the cards are vulnerable to skimming. In addition anti-skimming devices in ATMs help to control card skimming by fraudstars. Online fraud costs billions of dollars each year, making fraud detection and prevention crucial to minimize risk and maintain a successful business. 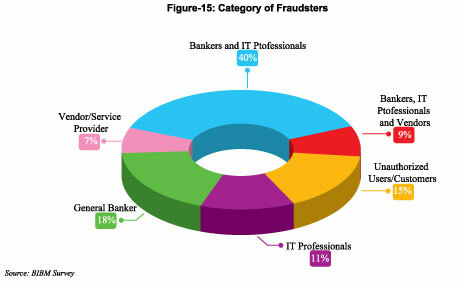 But still there is no established technology based fraud detection center in our country, like IC3 (Internet Crime Complaint Center) in USA, or IDRBT (Institute for Development and Research in Banking Technology) in India with a view to detect, prevent and monitor all types of online frauds occurred. To observe and analyze the status of frauds through electronic delivery channels committed in Bangladeshi banks, we have taken 50 fraud cases as a sample. The sources of collecting these cases are Bangladesh Bank, daily newspapers, victims and employees of different banks. According to our analysis (figure-14), we found that rate of frauds related to ATM and Plastic Card is the highest followed by Mobile Banking transactions. The figure-15 shows that in most of the fraud cases both bankers and IT professionals are jointly involved in perpetrating financial frauds. A reasonable number of unauthorized external users are also responsible for banking crimes. 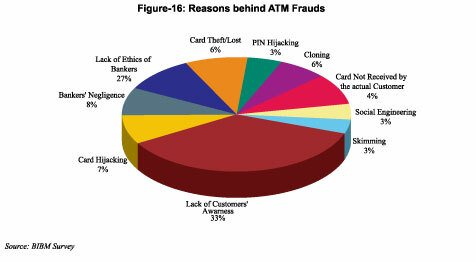 Reasons behind ATM Frauds: It is seen that most of the frauds occurred due the lack of awareness of customers (33%), followed by lack of ethics of bank’s employees (27%) and negligence of security issues by the bankers, 8% (figure-16). Fraud Prevention: Introduction of chip card in lieu of magnetic stripe card is necessary to stop mass frauds and secured ATM transaction. A large number of ATMs are not chip based card compliant. It is needed to replace the ATMs. If it is not possible to replace magnetic cards due to technological problem and huge investment, fraud can be minimized by ensuring Multi Factor Authentication (MFA) techniques like One Time Password (OTP), biometrics, etc. After each transaction SMS alert must be ensured to respective clients. Though, Bangladesh Bank issued a circular in this regard, banks failed to achieve the target. A number of frauds occurred due to the absence or delay of alert-SMS system of the banks. Sometimes, by changing the customers’ phone number (with the help of bank employees) message is diverted to the fraudster’s phone so that customers cannot know about the transactions. Any transaction related alert SMS should be sent to the registered cell phone number of the card holder only. Only responsible employees should access the KYC information of the customers from database. Without verifying proper document or application, bank officials should not have any right to change any information of the customer. And if changed, customer must be notified. It would be better, if bank change any information with the presence of customer after proper justification. It is bank’s duty to verify customers’ information willingly after a certain period of time to ensure the security of the online banking. Like check-book handover technique, bank should give the ATM card to the right customer. Sending cards by postal/courier services should not be allowed to avoid ‘card not received’ frauds. It is also seen that a number of frauds being committed in card issuing and activation process by the banks. Special care can be taken by bank management in this regard. To ensure better security adaptive method and data analysis techniques can be used by which transactions can be stopped or verified, if the pattern of withdrawing money seems to be abnormal or does not match with the previous patterns and history of transaction. Frauds and threats will increase in the upcoming days. Enhanced support of Bangladesh Bank would be needed to protect customers’ rights. Concentration may be given by Bangladesh Bank on security issues of ATM banking to protect customer’ savings. Multi Factor Authentication (MFA) can be mandated by Bangladesh Bank to enhance security and prevention of frauds. Bangladesh Bank can also play a prominent role in setting up a cell/wing including a data bank for all of the commercial banks. That will help to collect and share, up-to-date information regarding current status, growth, problems and frauds of electronic banking of the banking sector of Bangladesh. It is noted that that Reserve Bank of India has setup an institute named “Institute for Development and Research in Banking Technology (IDRBT, www.idrbt.ac.in)” at Hyderabad as an autonomous center for development and research in banking technology. Bangladesh Bank can take initiatives in this regard. PCI DSS Compliance: The Payment Card Industry Data Security Standard (PCI DSS) is a proprietary information security standard for the organizations that handle branded card services. The major electronic payment networks of branded card are Visa, MasterCard, American Express, Discover, Diners Club and Japan Consumer Bureau (JCB) etc. PCI DSS guideline is playing an important role to control and prevent frauds in payment card industry. The banks providing card services must comply with the industry security standard like PCI DSS to ensure card holder’s data privacy and minimize fraudulent activities related to plastic money. If a bank becomes compliant/certified with PCI DSS, then it will not only secure it’s plastic money transaction but also secure bank’s infrastructure and system. Banks providing card services must be PCI DSS compliant. 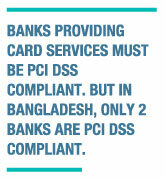 But in Bangladesh, only 2 banks are PCI DSS compliant. Network Link Down: ATM services of all banks are being hampered regularly and frequently due to acute network link-down instance. Now and then, the network goes out of order and service cannot be provided. To overcome this problem, it is needed to ensure redundant network connectivity from ATMs to data center. Support of the vendors is a major problem. In most of the cases vendors fail to provide better and quick service in due time according to the SLA. If possible, bank must select separate network service provider with different backbone network. To overcome this communication difficulty, banking sector of Bangladesh may think to develop a private network to ensure smooth and secured data communication services. Bangladesh Bank may take initiatives in this regard. Power Management: Though power sector have been improving in last few years, insufficient electric power, power disruption and poor backup system are the key issues. For redundant and backup power supply extra investment is necessary. Sufficient budget needed for installing and maintaining generator or solar system. Banks are suffering for lack of budget in this case. Management should give more attention. Maintenance of ATM System: Maintenance of system ensures maximum uptime. Proper and timely maintenance of ATMs is a must. But lack of budget and resource persons is a common problem. It is seen that banks heavily rely on vendors for maintenance of ATM system. But it is also seen that absence of dedicated vehicle is a major problem for them. Though banks almost totally rely on vendors for maintenance, budget constraints hold them to ensure right and timely maintenance. Each and every day new technologies are coming with new facilities and challenges. Up gradation of hardware and software is a part of regular maintenance. 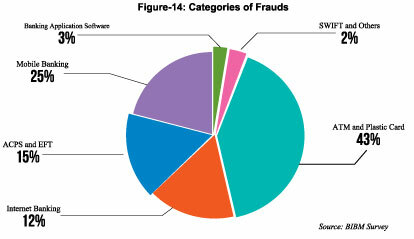 To reduce fraud and ATM dispute, implementation of updated or modern software (CBS and ATM) is a vital issue. Banks also have been facing problems in this regard. Management should take care of this issue. Cash Management: It is seen that cash management and availability of quality currency note is another challenge. Most of the cases, machines fail to dispense cash and stop to provide services due to poor quality notes for several hours. Human interaction is needed in that case and customers become angry and lose his/her patience and faith on bank. For ATMs, minimum standard currency notes must be ensured. But in Bangladesh quality currency notes for ATMs is a crying need. It would be better if central bank can provide new notes for ATMs only. Sometimes adequate supply of quality notes for ATMs is a problem. Help Desk: Currently near about one crore card holders are getting ATM banking services in Bangladesh. 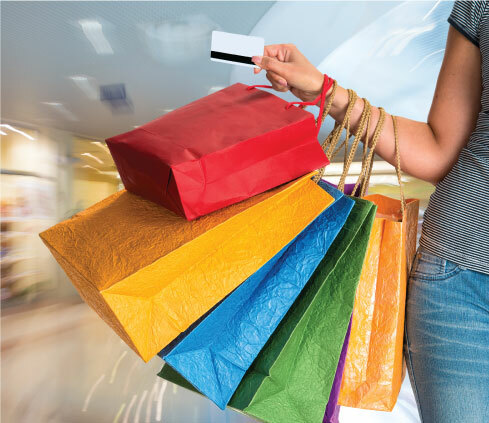 As customers and transactions are increasing rapidly, necessity of customer care is a vital issue. Customers are not satisfied in this regard. Though ATM is a 24-hour service; only 33% banks have round the clock call center services. Most of the cases customers fail to get any response from call centers. Due to budget constraints most of the banks are not able to provide round the clock Help Desk/Call Center service. Moreover, grievances are not handled properly in due time, dissatisfying customers. Awareness of Customers: Mass illiteracy and lack of proper IT knowledge of users is another obstacle in this business. To aware customers regarding operation and security is also a great challenge. The problem is more in the rural areas. Absence of awareness program and activities due to time, budget and resource constraint is another challenge. Frauds are also increasing due to the lack of proper knowledge of the customers. Fraudulent cash withdrawal from ATM by lost or stolen cards and PINs of careless customers is a common issue. Moreover, card theft (trapping, swapping, distraction), card cloning, Phishing, Shoulder Surfing for PIN and Social Engineering are the most common threats in this industry. Most of the cases customers apply for ATM cards and banks provide it without giving any technical or security warnings. Even printed documents or brochure regarding this new technology are not provided by the banks. Though, few banks put some information on their websites, this has no meanings to the majority of the customers as they are not well aware about searching information from bank’s website. Moreover, majority of the customers have no access to internet facilities. Banks always try to increase the number of customers only, rather giving minimum proper knowledge to the customers. When a customer is opening account or requesting an ATM card, even service options are selected by the branch employees that is not well-known to the customers due to lack of proper technical knowledge, leading to transactional risks. To educate customers and creating awareness for making secured ATM transactions leaflet, dangler, reading materials, notice or other papers should be kept in ATM premises. Audio visual technology can be used for increasing awareness among customers. Sharing ATMs: Banks are deploying ATMs in a scattered way. Sometimes, in a single point, huge ATMs are installed by different banks without justifying total demand, just to sustain banks image only, causing huge national loss. It is the right time to bring all ATMs under same umbrella. Bangladesh Bank has taken the initiatives by setting up a national payment switch named NPSB and only 48 banks have joined. Cost sharing instructions mandated by Bangladesh Bank for using NPSB is not welcomed by many banks. It is seen that some banks are charging more than the charge fixed by Bangladesh Bank and earning a bit after giving the sharing charge to the owner of the ATM under NPSB. In case of some banks, customers are being charged Tk. 20 rather than Tk. 10, which is prescribed by Bangladesh Bank. It created a negative impression among customers. They become angry and unwilling to pay such transaction charge for this delivery channel. Physical Security and Monitoring: Providing physical security of ATM booths due to political unrest and increased social crime is a big challenge of banks. A total amount of loss is estimated at Tk. 2.34 crore in 2013 due to political unrest and vandalism. Though police is available anywhere of the country, banks usually avoid taking help, if possible. As salary structure of the guards is not good, expected quality guards are not found with this constraint. A simple illiterate guard cannot give guarantee of the safety of the booth even without a stick. Some recent occurrences established this assumption. Frauds are also increasing because the guard is not even able to distinguish between a customer and a fraudster. Monitoring of ATM booths from a central point is also a great challenge. Absence of robust surveillance system, security software and hardware is another problem. If proper monitoring could be established, security would have been ensured remotely. Closely monitoring and strong supervision of ATMs through remote dash board can improve physical security. Surveillance activities can be enhanced. Zone wise vigilance team for sudden and regular visit can be formed for banks having large number of ATMs. Skilled Manpower: Maximum banks do not have experienced and expert ATM team to run ATM operation smoothly yet. Lack of skilled manpower/resource person influences banks for outsourcing, causing more costs, higher dependency on vendors and chance of increased frauds by maintenance operators. As ATM banking getting increased popularity day by day, banks are also planning to implement new and effective services in upcoming years. As a result, number of transactions would increase consequently. Complaints, grievances and dispute resolution within shortest possible time would also be needed to maintain the reputation of the banks. 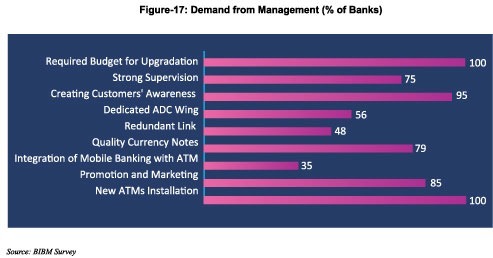 68% banks are demanding dedicated ADC team for quality services, control and better monitoring. Challenge of ATM Banking due to Mobile Banking Growth: Mobile banking is sometimes called Human-ATM banking. 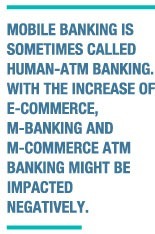 With the increase of E-commerce, M-banking and M-Commerce ATM banking might be impacted negatively. Mobile banking is more user friendly than ATM banking. People can keep in touch with the bank from anywhere and this is its specialty. Usage of virtual money will be increased in upcoming days. Also infrastructure development cost for mobile banking is comparatively less than establishment of ATM network. 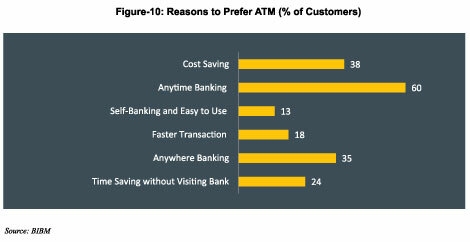 Around 56% banks think that Mobile Banking will have an impact on ATM banking both in negative and positive ways. Some banks think that it will certainly increase the number of transaction by ATMs as mobile banking customers can withdraw money from ATMs. But other believes this will reduce monetary transaction drastically. Business would now depend on account to account transfer more widely, which has impact on the entire monetary system of the country. Moreover, for cash withdrawal customers of mobile banking choose agent instead of ATMs. Some think that mobile and agent banking will be cost effective and popular in rural areas in upcoming days. Infrastructure Development, Investment and Role of Management: ATMs are concentrated on urban areas only. Most of the ATM users reside in the major cities, mainly in Dhaka and Chittagong. To increase the number of customers and popularity of ATM banking, mainly in Upazilla/Thana level and rural areas is another big issue. Management should give more attention in this regard. It is found that majority of the users belong to young group and male. Customers of other groups can be attracted by proper marketing channels. Management always demands more profits than goodwill and finally, social responsibility is ignored. Most of the banks mentioned that they have a huge loss due to ATM Banking services. Due to huge loss, management is also less interested to invest further for this channel. Lack of management interest to install ATMs in rural areas is one of the main factors. It is seen that demand of ATM-Banking is increasing day by day in Bangladesh. According to the survey, there is a demand of 15,379 more new ATMs by the banking sector all over the country in the upcoming years. More promotional activities and marketing strategies can be taken by banks to attract new customers and increase the demand of existing ATM market. Banks want to ensure at least two ATMs attached to each branch and rest of the ATMs installed in suitable places. But huge investment is needed in this regard. Moreover, maintenance cost of existing ATMs is a big issue for the banks as revenue is less than the expectation. In this scenario, management of banks is not willing to invest more in this sector. By introducing limited charges, revenue can be earned just to run the business in break-even state, not to make profit. ATM banking operation costs is increasing day by day in the whole world. This includes setup, maintenance, up gradation and monitoring cost of latest quality secured ATMs. Installation of security and monitoring devices of ATMs are also expensive. Proper budget allocation should be ensured. Duties on import of ATMs can be reduced to expand the ATM networks. Special steps can be taken by the govt. with the help of Bangladesh Bank. Technology-intensive delivery channels, like Automated Teller Machines (ATMs), have created a win-win situation by extending greater convenience and multiple options for customers while providing tremendous cost advantages to the banks. ATM banking is convenient and time saving to use as it acts like “mini bank” providing cash to the needy customers at anytime, anywhere whenever and wherever there is an ATM counter. 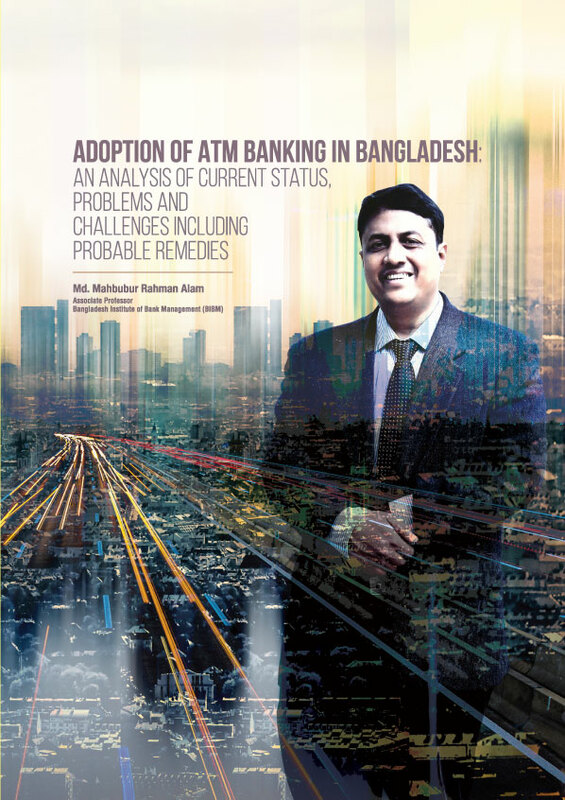 ATMs have gained tremendous popularity as a delivery channel for banking transactions in Bangladesh and has shown explosive growth in recent times. Approximately, Taka 1,500 crore has been invested in this sector by the banks. ATMs represent the single largest investment in the electronic channel services for the banks. While ATMs facilitate a variety of banking transactions for customers, their main utility has been for cash withdrawal and balance enquiry. To attract customers not only to withdraw cash from ATMs, new technologies can be introduced to provide Value Added Services (VAS) like fund transfer to other accounts, credit card payments, mobile banking, utility bill payment, top up, etc. This will increase the customers’ convenience and also make it a profitable channel for banks. Banks should be able to provide enhanced interactivity, diversified offerings, as well as facilitate customers to participate in improving the service encounter with ATM and make it a memorable and pleasant experience. 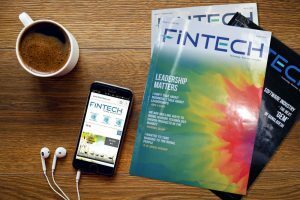 The rapid increase in the number of automated delivery channels and customers’ preference to use ATM because multifaceted attributes are creating pressure on banks to respond aggressively to meet the customers’ needs. The study provides necessary policy input to the bank management to increase customers’ satisfaction through improving ATM service quality. Banks should develop strategies to motivate non-users of ATM service through awareness, education, extending personalized services, and demonstrating the functions of ATMs. Quick response to customers’ needs and queries about the ATM-related services are important to improve the service standards of ATM. This would help customers to participate in improvement of service quality, learn and perform, and have a pleasant experience through two-way communication. Most of the ATMs are installed in the divisional cities and district towns. Around 44% ATMs are installed in Dhaka City. 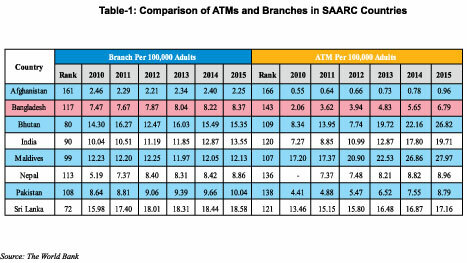 Very few ATMs are however being operated in rural areas (less than 4.84%). It is mentionable that 46% of the ATMs has been set up by DBBL alone. Other banks should come forward to install more ATMs, mainly in rural areas, to expand the network. The banks may identify more locations for establishing new ATMs; however, if it is not possible either due to non-availability of space or resources crunch, they can have mutual cooperation in setting up new ATMs at suitable locations and sharing existing ATMs so that customers are able to do ATM transaction in the places where there is no ATM of their own bank. This will further enhance the customers’ satisfaction. However, security is a great concern and frauds are increasing worlwide highly. It is seen that a group of bank employees including IT people and vendor are also being involved in such type of ATM frauds. Customers’ awareness is also a great concern. Central Bank including all banks must take special care in this regard.